Here's my card for the current My Favorite Things Wednesday Sketch Challenge. I paired the sketch with the new Martini Time stamp set and dies and the current MFT color challenge for this fun, fresh design. 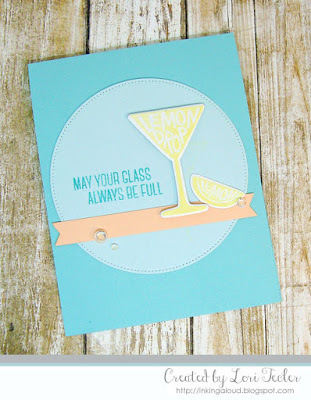 I started off with a Summer Splash card base with a large Sno Cone pierced circle die cut on top. A long double ended fishtail flag strip, cut from Peach Bellini cardstock, was placed across the circle. The Lemon Drop martini glass and lemon were stamped on white cardstock with a lemon yellow pigment ink. The ink is a pale color, so for extra contrast, I used my MISTI and did a little repeat stamping. After die cutting the images, I arranged them on the circle, using foam tape to give the glass some dimension. The fishtail flag strip helps to ground the images and adds a bit of contrasting color, too. The set's "may your glass always be full" sentiment was stamped to the left of the glass in Summer Splash ink. A trio of clear jewels were added around the fishtail flag strip for a bit of fun sparkle.